Natural oils known as phenols give pine shavings their distinctive aroma and provide a nice clean scent when used as animal bedding. Although rabbits, guinea pigs and other small animals sometimes develop liver disorders when exposed long term to pine shavings, chickens don't have any ill effects from them and may actually benefit from their use. Pine shavings absorb liquids and reduce the amount of ammonia smell in the air that can give your chickens an eye or respiratory infection. Chickens enjoy nestling into the shavings, which heat up to the coop's surrounding air temperature quickly, helping chickens insulate themselves against the cold. Pine shavings are readily available in compressed blocks in pet and feed stores at an economical price. Do not use sawdust or pine shavings that are not labeled "dust extracted," as the enclosed environment of your coop leaves dust particles hanging in the air for long periods of time. 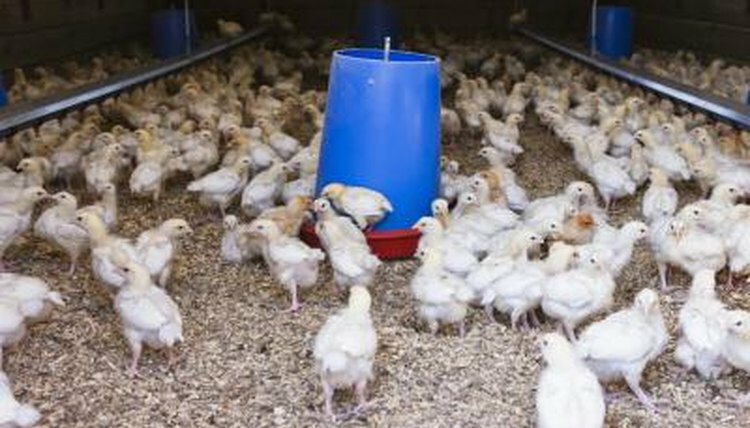 Breathing in these particles can cause respiratory issues for both chickens and humans alike.